Here is a link to my short term SPX chart, following up on last night’s post. I did watch the market today and that was nothing to get excited about on the long side. A few wildcards to deal with: (i) short week, (ii) NFP on Friday and (iii) earnings kick off in ~2 weeks. I updated my short terms SPX chart here. I also posted a picture of my SPX chart below. I think we will have a mini-rally into the NFP and we might continue to rally into next week as this is a holiday week. I think money managers come back next week and start to think about exposures and risk. In short, I think the market moves lower into mid September. It is not all down, but the trend will be lower with targets at 1515-1520 and eventual convergence with support line from the March 2009 low around early September. 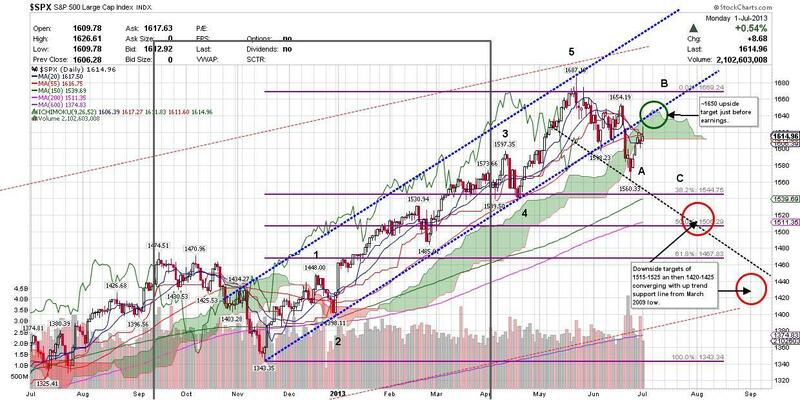 That should put the SPX around 1420-1425. I will put a few shorts on this week and look to hedge my longs into the short term upside target of ~1625-40. When I feel really confident of this move I will aggressive trim the longs and juice the short. I am not there yet. ** UPDATE 2: I shorted the SPX, but in a small position about 1/3 of target size. I shorted the YEN and went long VOL. All positions are manageable and I can close or increase the size.